Qualities: Prosperous, resources rich (ores), superstitious. 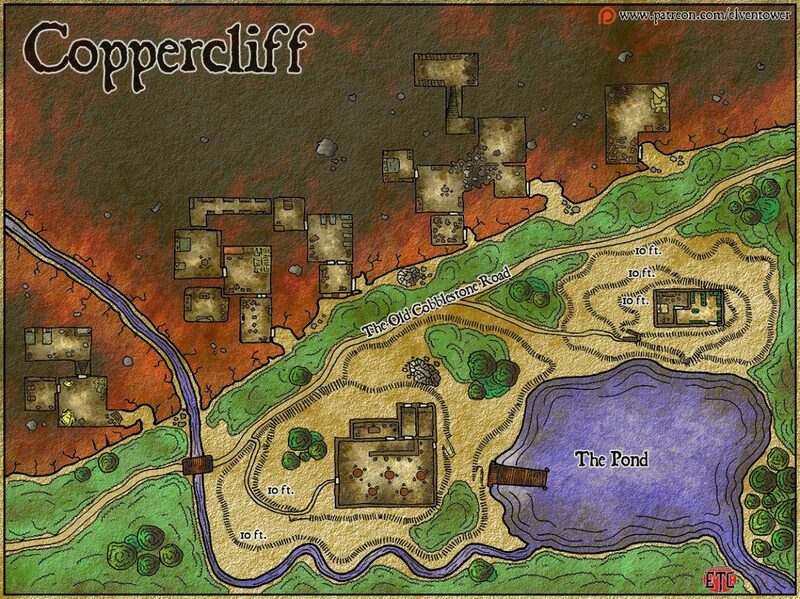 Coppercliff is a small town built into the face of a red earth cliff. Mainly halflings live here, although there are a few humans and some gnomes. The dwell here because of the town’s proximity to the copper mines north east of town. Everyone either works on the mines or is related to the copper selling business. Facing the cliff are two buildings on top of hills. The westernmost one is a tavern, merchants come here all the time to sell their wares or pick up copper and coal shipments, they stay here since it’s the only building in town with proper human-sized accommodations. They don’t have private rooms for travelers. At night some tables are moved and people sleep in the main room. The other building is a house with crystal walls, when the sun is in the right angle, the house shines like a star. Inside of it, the climate is really warm and humid, there is a hobbit druid here who cares for lots of plants that grow inside the crystal house. People are amazed at the exotic fruits the druid harvests all the time, he can even produce fruits from warmer climates. South of both hills there is a small lake where some fishing is done. The water is crystal clear, it comes from a natural spring up in the mountain range. Rodger.- Town’s Deputy. This halfling commands the small guard force. He is considered the only authority in Coppercliff. Marina Gudari.- This fat halfling tend the tavern with the help of her young son Tom. Fardell.- Human druid who built the greenhouse, he lives here because the water coming from the mountain natural spring is ideal for his planting endeavors. Mortok Fug.- Traveling gnome merchant from a nearby city. He comes with a detachment of guards who stay on his caravan carts, he stays at the tavern. As the adventurers reach Coppercliff from the northeast, either because they are going there or just passing, it is obvious something just happened here. There is smoke coming out from one of the cliff houses, some house doors are torn apart, hanging on their hinges. There is no one to be seen and the body of a halfling lies on the road on a small pool of dried blood, a black arrow piercing his back. This small town is right now under occupation of a band of savage gnoll brigands. They took the town during the night, taking everyone by surprise. The small town only had a token force, they couldn’t contain the gnoll party. 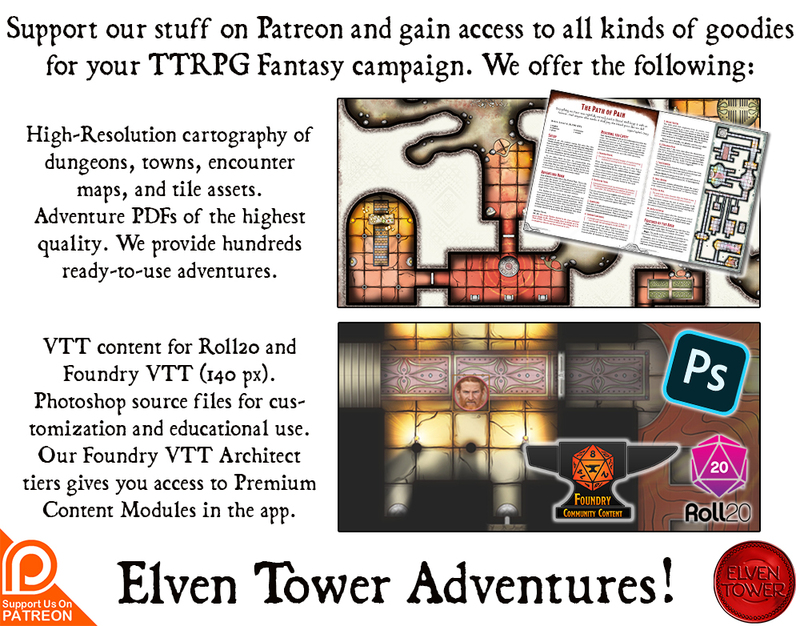 Some of the halflings and other townsfolk are dead but most were bound and imprisoned in the tavern or one of the houses. The gnolls can eat them later if they are left alive.